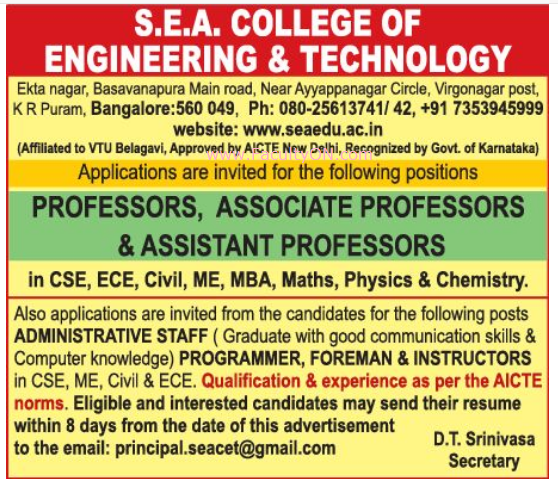 S.E.A.College of Engineering and Technology, Bangalore has advertised for recruitment of Teaching Faculty- Professor / Associate Professor / Assistant Professor Plus Non-Faculty jobs vacancies. Interested and eligible job aspirants are requested to apply within 08 days from 05th December 2018. Check out further more details below. About College: S.E.A College of Engineering and Technology (SEACET) is established in the year 2007-08. Initially, it started functioning with Computer Science, Electronics and Communication, Information Science and Mechanical Engineering branches, offering 4 years duration Degree Programme in Engineering. A two years duration Masters Programme in Business Administration (MBA) was added in the year 2008-09 where a 4 years duration degree programme in Civil Engineering was introduced in the year 2009-10. How to Apply: Interested and eligible candidates are requested to send CV along with copies of certificates and PP size photos to the email address given below.